Grace, this is my idea of heaven. thick cheescakey goodness and cherries, YUM! I love alliteration too, and onomatopoeia. I love most language devices actually! 1) I don't know how you don't just LOVE cheesecake, it's nearly perfect!!! And this looks so yummy! And yes, the vibrant red looks perfect against that creamy white. I'd say it's an alliteration and a tongue twister. This is gorgeous. One of my fave desserts and I thank you for resisting taking a bite of until after taking the photo! Ha! A cheery cheesecake it is! I tend to get quite carried away with alliteration as well--I used to write whole alliterated sentences just for fun when I was little. Yes, I am a little strange...or should I say somewhat surprisingly strange? Deeeeelightful photo of a deeeelicious dessert! I get a kick out of alliteration too. haha Are we nerdy? hahaha!! i do the same thing...minus the alliteration. I often wonder if it bugs people that I don't name my recipe in the title...I'm guessing yes? I love cheesecake, but it doesn't like me at all, yours looks amazing! That's a beauty of a cheesecake! That cheesecake looks amazing! One of the best desserts on earth. I love a good cheesecake, especially if it has fruit on top. Great photos Grace. Perfect with the cherry topping! What a divine cheesecake this certainly is!! How bright and cheery! Nice job. Calculus....yuck! :) Cheesecake makes me happy though :) As long as it's not thick. I like a nice creamy cheesecake. Haha I love your witty wordplay :) I'm mildly obsessed with these ridiculously random national food holidays... apparently yesterday was National Jelly Bean day? I never find out until the day of, though, so it's always too late to celebrate with a blog post. I need to research ahead a bit and find a completely random food holiday to celebrate soon. Oh, and your altruistic cheesecake? YUM. I adore your titles! This cheesecake sounds fab! I love that you use lots of cream cheese. Hooray cheesecake! I'm not really with the whole fruit-stuff with other stuff (though I'm getting better), but I can really appreciate how those colors POP! I love plain ordinary cheesecake, but won't touch it with toppings. Go figure. Yours looks great with the cherry topping. That cherry cheesecake is staring at me and asking me why I don't know what alliteration is! This looks insanely good, though. I could definitely be persuaded to have a slice of this. It's beautiful! I love alliteration too... and I love your post titles. I started trying to make mine the names of my recipes now because I recently went through that same frustration when I was trying to create my recipe index (who am I kidding? I'm still in the midst of creating it!). But I think creative post titles draw people in. The cheesecake looks spectacular. Cheesecake isn't top on my dessert list, but I do enjoy it from time to time. That small slice of cheesecake (just the right size) with that cherry sauce crowning it is my idea of a very pleasurable moment spent savoring every bite! 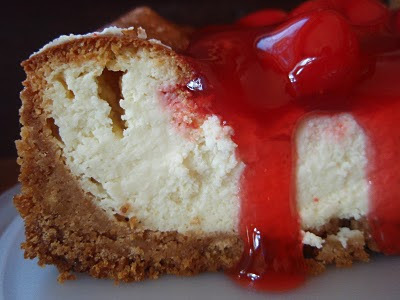 Oh my Grace, cheesecake is a great weekness of mine, and here I'm going to bed with this addictive treat on my mind! Love it! I am part of the LOVE CHEESECAKE club. No sacrifice at all when a recipe like this is involved... wow! Grace, that is one beautiful cheesecake and I sure would LOVE a slice. Cheesecake is one of my absolute favorites. The cheery cheery cheesecake chortled "cheeeeeeeeeese" for chef Grace's charming post. the profile shot with the graham cracker crust and translucent red rivulets of cherry sauce are torturing me! A cheesecake just isn't a cheesecake without sweet cherries on top! I love that you love alliteration so much! Cheers! Well, I simply adore alliteration, as I do this cheesecake. Oh that looks so beautiful!!! 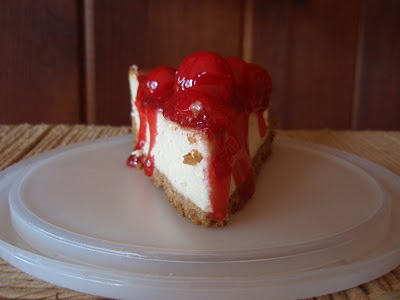 I have never had a cherry cheesecake, I think it's such a classic that when I do go for cheesecake eating i tend to go for the different flaovrs, but I'm willing to try it you make it look so scrumptious. I love a red dessert and I really like cheesecake with a biscuit base. This seems like something that I would really enjoy. I love how the cherry sauce is oozing over the cheesecake. It makes me want it more. will have a piece of that. Do you know I ADORE non-homemade cherry pie filling, I will eat it straight out of the can! Would love it on this. I saw that and thought "the hell? She doesn't even LIKE cheesecake!". That's a pretty fine example for a dessert you don't much care for. Agreed, I absolutely adore aliteration. Ahah! (note the wave). I love your titles and I love cheesecake! Yours looks fantastic! And about that red ink it is hard for teachers not to use it. It stands out! Not that most students pay attention. but you have to try! I wish I could say I didnt like cheesecake...but I could probably eat a whole pie myself! OhMyWord I had to laugh out loud about the title thing. My main blog, i am mommy, is WRETCHED like that. So when I started my baking blog I said to myself, "Self! No weird titles, just name it and title it!" I just prefer other desserts - cakes, pies, cookies. This looks SO good! She's a beauty! "Nother nashin' nom! And another great title. I adore alliteration as well :) Can you tell by my blog title? I also cherish cheesecake! Cheesecake with red cherry sauce definitely brings cheer here :D That's my favourite! I looooove cheesecake, although I don't love cherry cheesecake so much. But I do love your alliterations. Yumm. Love cheesecake. And alliteration :) What can I say, I was an English major in college! Oh man, that looks wicked good! Cheesecake is one of the best things ever. As a food-conniseuer and New Yorker, tell me this: What is the difference between Chicago and NY style pizza? Which one do you like better? Mouth is drooling. Cherry Cheesecakes have to be on of my favourite because the tartness of the cherries balances out the sweetness of the cheesecake. Yum! i'm not a big cheesecake (cream cheese in general) fan, and typically cringe at canned fillings, but I have to admit this looks incredibly tasty. What a stunning looking cheesecake. I never tired of this classic. I don't have much of a sweet tooth, but a great cheesecake with cherries on top are hard for me to resist. lol! who doesnt love alliteration! Cherries and cheesecake were made for one another. So glad cherry season is right around the corner here. Without a doubt, cheery! And it is positively pretty! Well worth making just to look at, though I'm not above craving a slice or two of cheesecake on special occasions. I don't care what the name of the post or the recipe is. I love that they are witty. I am just so in awe of your creations & sweet treats. This cheesecake looks awesome!